The emblem combines a snow crystal and a sun rising over a mountain. The yellow, orange, and blue colors represent the varied Utah landscape. 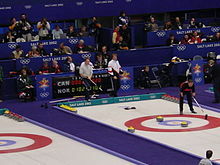 "Call of the Champions"noicon composed by John Williams for the 2002 Winter Olympics in Salt Lake City. Performed by the Mormon Tabernacle Choir and the Utah Symphony Orchestra. The choir sings the Olympic motto "Citius, Altius, Fortius" which is Latin for "Faster, Higher, Stronger." ↑ अ आ The IOC site for the 2002 Winter Olympic Games gives figure of 77 participated NOCs, however one can count 78 nations looking through official results of 2002 Games Part 1 Archived जनवरी 3, 2014 at the वेबैक मशीन., Part 2 Archived जनवरी 18, 2014 at the वेबैक मशीन., Part 3 Archived जनवरी 18, 2014 at the वेबैक मशीन.. Probably this is consequence that Costa Rica's delegation of one athlete joined the Games after the Opening Ceremony, or this is consequence that Puerto Rico delegation of two athletes did not start in two-man bobsleigh event. ↑ "The Olympic Winter Games Factsheet" (PDF). International Olympic Committee. अभिगमन तिथि August 5, 2012. ↑ "What is the Olympic motto?". Olympic.org. 2013. मूल से September 18, 2015 को पुरालेखित. अभिगमन तिथि 4 September 2015. ↑ अ आ Salt Lake Organizing Committee (2002). Official Report of the XIX Olympic Winter Games (PDF). पृ॰ 35. आई॰ऍस॰बी॰ऍन॰ 0-9717961-0-6. मूल से October 8, 2010 को पुरालेखित (PDF). अभिगमन तिथि October 20, 2010. ↑ "Air Edel | Composers | MARK WATTERS". मूल से May 5, 2011 को पुरालेखित. अभिगमन तिथि May 14, 2011. ↑ Salt Lake Organizing Committee (2002). Official Report of the XIX Olympic Winter Games (PDF). पृ॰ 36. आई॰ऍस॰बी॰ऍन॰ 0-9717961-0-6. मूल से October 8, 2010 को पुरालेखित (PDF). अभिगमन तिथि October 20, 2010. ↑ अ आ International Olympic Committee (2002). Marketing Matters. मूल (PDF) से 25 December 2018 को पुरालेखित. अभिगमन तिथि October 20, 2010. ↑ "Salt Lake 2002 Official Report of the XIX Olympic Winter Games". Salt Lake Organizing Committee. 2002. पृ॰ 41. LCCN 2002109189. आई॰ऍस॰बी॰ऍन॰ 0-9717961-0-6. मूल (PDF) से 25 December 2018 को पुरालेखित.